QUERETARO, Mexico – Dec. 10, 2015 – The Rock ‘n’ Roll Marathon Series is rolling into another Mexican destination with the addition of the Rock ‘n’ Roll Querétaro Marathon & 1/2 Marathon on Sunday, Oct. 2, 2016. This will be the first marathon distance for the Rock ‘n’ Roll Marathon Series in Mexico. Previously the Querétaro Marathon, Rock ‘n’ Roll Querétaro is now part of a worldwide series of musically-themed marathons and half-marathons, uniquely combining entertainment and running into a 26.2 mile block party. 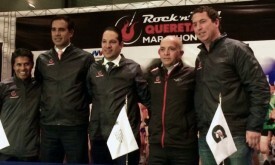 The Rock ‘n’ Roll Querétaro Marathon aspires to be Mexico’s premier Marathon. It is the dream of former marathon champion, German Silva, to deliver a world-class marathon in Querétaro and Rock ‘n’ Roll Marathon Series is up to the challenge. The event will feature live bands positioned on entertainment stages along the scenic course, which will start and finish in the heart of Querétaro. The running festival experience is topped off with a finish line concert featuring a major headline act. Race weekend in Querétaro will begin with a two-day Health & Fitness Expo at Querétaro Congress Center where all participants go to pick up their race number. The expo will feature several running and fitness retailers, exhibits with free nutritional samples and a series of interactive clinics. Presale entries and special pricing is available through December 16th, after which registration will then close and reopen in January. Presale pricing is $45 for the marathon and half-marathon and $30 for the 10K. For more information about the inaugural Rock ‘n’ Roll Querétaro Marathon & 1/2 Marathon, please visit runrocknroll.com/queretaro. Organized by Competitor Group, the Rock ‘n’ Roll Marathon Series is the ‘World’s Largest Running Series’ with more than 600,000 runners taking part in events around the world every year. Started in 1998, the simple idea of making running fun has transformed the U.S. running landscape by infusing the course with live bands, cheer teams and entertaining water stations, creating a block-party atmosphere for participants and spectators alike. Today, the series of marathons and half-marathons has spread to 30 destinations, drawing visitors from around the world. Over the 18-year history of the Rock ‘n’ Roll Marathon Series, charity partners have raised more than $305 million through the events for a variety of worthy causes. Race weekend kicks off with a free Health & Fitness Expo showcasing the latest in running gear, sports apparel, health and nutritional information and much more. Events culminate with an entertaining finish line festival featuring some of the biggest names in music, with past headliners like Macklemore & Ryan Lewis, Aloe Blacc, Pitbull, FloRida and Bret Michaels. For more information, please visit RunRocknRoll.com or follow @RunRocknRoll on Twitter.